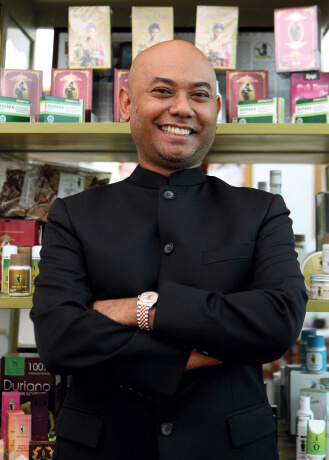 Syed Muhamad Ghadaffi Syed Ali, founder and CEO of Jamu Mak Dara Sdn Bhd (JMD), is a man who thinks on his feet. Present him with a conundrum and he will figure out a way to solve it — like when he needed to sell bedsheets during the 1997/98 Asian financial crisis, when retail goods were just not moving. His boss had told him to achieve RM200,000 worth of sales — an impossibly high figure at the time — but he managed to do it. “The idea was to generate sales by getting a large number of people to shop. So, I organised a warehouse sale,” says Syed. He rented a school hall in Petaling Jaya that was about the size of four badminton courts and laid out his wares. There was so much space available that he called other brands, such as Larry, Wacoal and Dunlop, to participate so that they could clear out old stock, and he would take a percentage of their sales. Syed printed 100,000 fliers and either handed them out personally or deposited them in mailboxes. “Some people chased me out and sometimes, I was chased by stray dogs. It did not matter because the warehouse sale was a major success. The turnout was incredible and I managed to sell RM450,000 worth of bedsheets in just four days,” he says. That was more than the seemingly impossible target that his boss had given him. “I still feel that this is one of my biggest achievements to date,” says Syed. Times were hard and he was ready to snap up and capitalise on any opportunity that presented itself. Soon, he was taking food orders from colleagues to generate side income. “I enjoyed cooking, so I cooked nasi lemak and curry puffs for my colleagues. Gradually, the orders got bigger and bigger, from 200 people to 300 people, until I received a request to cater for a wedding of 1,000 people,” he says. As it was too large a job to handle alone, Syed asked his mother, Halimah Shuib, to help out. Together, they pulled it off by borrowing catering appliances from friends. After catering for a few more events, a friend of his, who was working for a publishing company, asked him if he and his mother would like to publish a cookbook. Syed was not one to ruminate on an opportunity for long. As soon as he received the offer, he went to a store to buy a ream of A4 paper. “At home, I sat in front of my mom and asked her to list 100 recipes. Later, I went to a cybercafé, typed everything into Word documents, saved them on a diskette and went back to that friend; all in just a week’s time,” he says. Syed organised a huge event at the Putra World Trade Centre to launch the book. The event was well attended by prominent figures and celebrities, not to mention the media. A reporter, who was interviewing his mother at the time, was more interested in the secret behind her strength, beauty and still-slim waistline, rather than the recipes themselves. “My mother told the reporter that she consumes homemade jamu religiously. She was asked for the name of the jamu, but it did not have a name. It was the recipe of my grandmother, Mak Dara. So, we told the reporter that it was called Jamu Mak Dara,” he recalls. The reporter went back and wrote the story with a saucy headline, talking about Halimah’s jamu and its benefits. Syed’s phone number was printed under the article. Suddenly, his phone was ringing off the hook. “People wouldn’t stop calling me from 7am to 2am every day for two weeks. And that was how selling jamu became my full-time job,” he explains. Jamu is a traditional medicine from Indonesia. It is predominantly herbal, made from things like roots, bark, flowers, seeds, leaves and fruits. Sometimes, the recipes contain products from animals or bees such as milk, kampung eggs, honey and royal jelly. These concoctions help to increase strength, eliminate toxins in the body, increase metabolism, ease period cycles and even increase one’s sexual drive. Despite the inroads made by modern medicine, traditional supplements such as jamu, have a firm presence in the market and are widely consumed in countries like Indonesia and Malaysia. Despite the initial boost provided by the article, getting the word out to grow the business was not easy. This was all new territory for Syed. He knew he had a good product to sell but had no idea how to market it. “Mind you, this was when internet connections were a luxury and I did not even know what email was. I was trying to figure out the best way to get my product known nationwide and after a lot of thinking, I decided that direct selling was the best way to go,” he says. Syed went to the offices of mainstream newspapers, walking from desk to desk to promote his product. He gave each employee a bottle to test. “Some people were nice and said they would try it and inform me if they felt any changes. Others would not even acknowledge my existence or brush me off the minute I arrived at their desk. But I did not let that stop me,” he says. This was where he honed his public relations skills. He received enough responses to help him learn about the product and the brand. For a one-man show like Syed’s, customer feedback was extremely important. “I always tell my consumers that if it is not good, please let me know. If it is good and it has worked for you, please share the benefits with your friends,” he says. He thinks the problem with small entrepreneurs these days is that they have no idea how to market effectively. They spend a great deal of money they do not really have on huge billboards. Although it does help customers recognise their products, it does not even come close to matching the power of word of mouth, says Syed. However, he does admit that direct marketing is not for everyone. For it to work effectively, you must know how to approach people. “You must be able to effectively tell people why they should spend their money on your product,” he says. After establishing the company in 2007 and recruiting a small team for the business, Syed settled into an office in Taman Melawati, Kuala Lumpur. His sales grew by leaps and bounds, with the monthly profit jumping from RM3,000 to RM6,000, then RM24,000 to RM45,000 and eventually RM120,000. But he still received flak from outsiders who did not understand how the business was growing. “My storeroom was quite small back then. When a bank officer visited once, he laughed at its size and the fact that it was the only storeroom I had. I told him, ‘For your information, although this room is small, the products in it make millions. Furthermore, all these have already been sold and are just waiting to be shipped’. He was speechless,” says Syed. In 2012, he decided that the company was finally a success. It was selling up to 60,000 bottles of jamu a month and the brand was known throughout Malaysia. It was at this point that he diversified his marketing strategy with advertisements in the mainstream media and on billboards. There was a downside to all this publicity, however. Because the product was doing so well, counterfeiters sprang up in the market with products that had exactly the same packaging but vastly different ingredients, one of them being curry powder. JMD hit rock bottom when the counterfeit products flooded the market. Sales dropped from about RM1.2 million a month to only RM200,000. And the numbers remained there, making it difficult for Syed to sustain the business. “It was the toughest time for me. I felt like the company would go bankrupt. I was scared … but not defeated. I went back to the office and, pen in hand, tried to figure out a way to fight back. I started listing down ways to deal with these counterfeit products and get my consumers back,” he says. The problem went on for four months and Syed decided to report it to the Ministry of Domestic Trade, Co-operatives and Consumerism. But the problem was so widespread that it did not help much. “We decided not to wait and took it upon ourselves to overcome the problem. If we had waited for the help promised, it would have taken months before it was even addressed,” he says. Along the way, there were other challenges that almost broke his fighting spirit. For instance, some of his attempts at other side businesses met with failure when he was cheated by his own staff. His jamu business faced challenges too, especially with the influx of new players coming into the market. “There are a few prominent players in the local women’s health and beauty industry that claim to sell jamu. But if you look closely, you will see that they are actually selling cosmetics and other supplements that have nothing to do with jamu. They just use the word to attract consumers,” he points out. Syed has decided that it is time to take the business to the next level. He is looking to list the company on Bursa Malaysia by 2018. But before that, he will raise funds on an equity crowdfunding (ECF) platform and use the money to tap such markets as China, the Middle East and Australasia. “We will start scaling our business in these countries, starting in the second half of 2017. If it successful, our journey to an initial public offering will be a lot easier. While a listing will help elevate our presence in foreign markets, we feel that we cannot afford to wait. We will not take the wait-and-see approach, we need to move quickly,” he says. JMD will kick off its crowdfunding campaign soon. These ECF platforms are licensed and have been operating in Malaysia since June 2015, but not many companies have come on board. What makes a company like JMD turn to ECF for financing? Syed says this exercise will be a good education for him and his team in preparation for its IPO. The money raised from the ECF will be used to develop more products. The company currently has 30 products in its range, including supplements, coffee, a female hygiene wash, body scrubs and lotions. It plans to introduce 20 products by the first half of this year and is targeting to have 100 products by the end of the year. Competition in the Malaysian market can be tough. Syed’s previous efforts to introduce new products met with copycats almost immediately. “Once, I launched our own line of sanitary napkins and it only took a month before other people started to sell Malaysian-made sanitary napkins as well,” he says. Syed is on a quest for continuous self-improvement. He dropped out of school at 14 years old because of a lack of funds, but that has not prevented him from learning or educating himself. He is currently doing an Executive Diploma in Business Management course at Universiti Malaya. “I am only halfway through, but at least I took the effort to pursue it because I do not want to be left out,” he says. His advice to aspiring entrepreneurs to think about the challenges before thinking about profit and success. To him, business is like a gamble — you can either win or lose big. The best entrepreneurs are those who can handle failure and downturn. “If you want to be successful in business, you need to have a strong heart and a thick skin. No matter how big the challenge is, you cannot quit. Even if the obstacle is too big to handle and you are forced to your knees, get back up and do not be discouraged. Keep on improving yourself, fix what it is broken. And God willing, you will be on track again,” says Syed. The company currently generates more than RM6 million per year, with a compound annual growth rate of 22% to 26%. He realises that this year will be difficult but he is not one to shy away from challenges. He will continue to think on his feet and figure it out along the way.